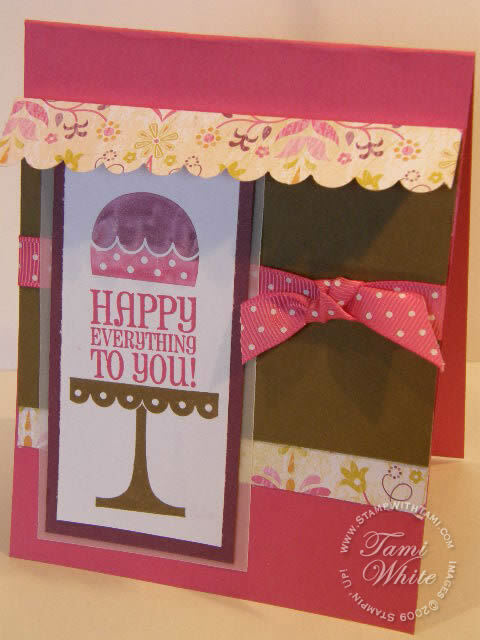 Here is a super cutie-patootie card that I created for stamp club this month. It uses the brand new Stampin’ Up On A Pedestal Stamp Set, Razzleberry Lemonade designer paper, and Melon Mambo polka dot ribbon. The cupcake is colored with stampin’ write markers directly on the rubber, then stamped on the paper. This card also features Soft Suede card stock and ink (new In color). The awning effect was created with the scallop edge punch. super, super cute. This is beautiful, what a great combination of colors. I like this melon mambo a lot. This is a really cute card using the new in colors. I love the stamp set and that polka dot ribbon. Aren’t the new In Color colors fabulous?!?!? I love them, almost as much as I loved Wild Wasabi 2 years ago. Love the new colors! But I miss the retired colors. Also do you plan on having any new Stamp with Tami shows? You are an excellent teacher and I learn so much. Now if only I had the time to do it all. Keep up the good work! What a great idea with the awning!! The new in colors look awesome! I made one similar to this using Crazy for Cupcakes. Thanks for such great ideas! I just love this card and can’t wait to use the stamp set!! The cards that your members make are just beautiful, and you too!!!! I love this card! I just became a demo and will receive this set soon! Now I have an idea to use it! Thanks! This card is precious, I love the new in colors! Soooo CUTE!!!! I love this, I guess I will wait this stamp set.